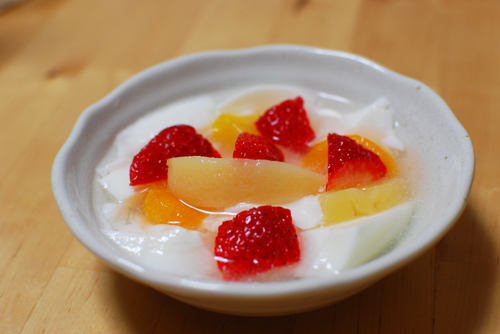 Almond jelly is an incredible dessert that came from China. Originally it was part of the 4,000-year history of Chinese medicinal cooking, but today in Japan it’s a tremendously popular dessert menu item, especially among women and children. There are several flavors, but the most popular are the ones that use seasonal fruits. Mango, strawberry, I think you’ll be surprised. It’s delicious. My friend is a self-anointed almond jelly expert, and if you ask him almond jelly has recently come close to the authentic flavor of China. The jelly part has gone from jelly to a softer texture, like pudding, that’s very good. There’s no day when he doesn’t eat some. I know he’s never actually been to China, but it’d be sad to point that out so I just agreed with his exaggerations. I don’t really know if the flavor’s getting more genuine, but it is true that it’s gotten more delicious. Everyone should definitely verify that with their own tongues.